Animal prints offer our wardrobes a refreshing sweep of sophistication and a gentle pop of power. This 2018 trend is one of our favorites this season because though the pattern is bold, there is a minimalist quality to the print. The neutral color palette of black, dark orange and muted yellow allows for a patterned addition to our fall and winter capsule wardrobe, and adds an edgy element to our blacks, grays and creams that are our go-to colors. Below are our 5 favorite silhouettes in Leopard print from sustainable, fair trade and ethical brands we love. 1. Lula Shirt by The Posse, $180 | Handmade and elegant, this top is an inclusive and edgy rendition on a sophisticated blouse. 2. Leopard Cami by Ziran, $145 | Made locally in Los Angeles from sustainably produced silk, this 90s-inspired cami is elegant and versatile. 3. Bea Skirt by Reformation, $148 | Ref always brings on-trend must-haves that are timeless and made from deadstock, recycled and sustainable materials. 4. Twiggy Dress by Rixo, £185 | This female-founded brand uses hand-painted techniques to make this 100% silk slip dress the perfect statement piece all year round. 5. 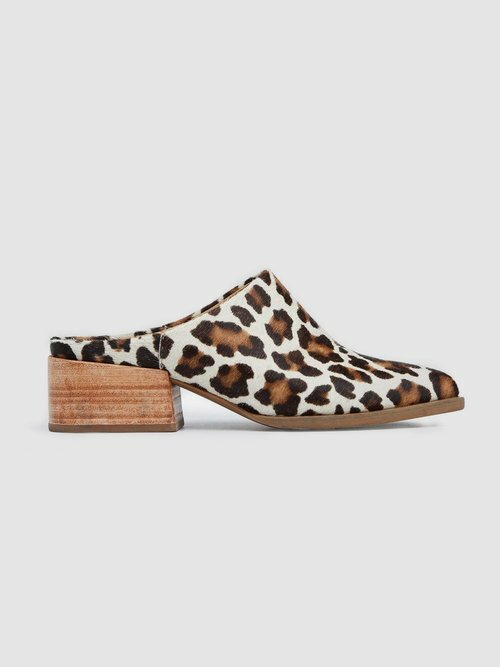 Miriam Mule by Able, $168 | We love that ABLE is transparent about their production practices, and these shoes are a beautiful handmade staple.